Barner signed a one-year contract with the Falcons on Thursday, Will McFadden of the team's official site reports. Analysis: Barner played in nine games between the Panthers and Patriots in 2018, carrying the ball 19 times for 71 yards. The six-year pro will provide depth in a Falcons' running back room that includes Devonta Freeman (groin), Ito Smith, Brian Hill and Jeremy Langford. He appears to have recovered after landing on IR with a knee injury Week 17 last season. Analysis: Barner handled return duties for the Panthers from Week 13 to Week 16 before ultimately landing on IR with a knee issue. He earned just one target in the passing game with Carolina after a midseason release from the Patriots. The vacancy created by the move allowed the Panthers to promote offensive lineman Dorian Johnson from their practice squad. Analysis: Barner was initially announced as doubtful before he was quickly upgraded to questionable. The 29-year-old was added to the injury report as a non-participant Thursday, so the specifics of his injury remain unclear. Analysis: Barner wasn't listed on the injury report Wednesday, so the specifics of the issue remain unclear. The 29-year-old's participation at practice Friday should provide a better idea of his availability for Sunday's season finale against the Saints. Analysis: Barner will make his Panthers debut after being scooped off waivers ahead of Week 11's contest. He won't get any reasonable time in the backfield behind Christian McCaffrey, but Barner may be tasked with returning kicks since Damiere Byrd (arm) is on injured reserve. Barner (coach's decision) is inactive for Sunday's Week 11 tilt against the Lions. 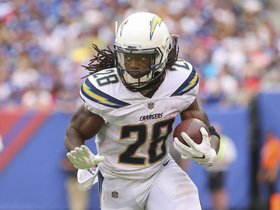 Analysis: Barner and Travaris Cadet were both added to the Panthers roster this week as running back reinforcements, but neither will suit up Week 11. Barner could potentially work his way up to active status in the coming weeks behind the top duo of Christian McCaffrey and Cameron Artis-Payne. The Panthers claimed Barner off waivers Wednesday, Joe Person of The Athletic reports. Analysis: After being cut loose by the Patriots earlier this week, Barner will return to the team that drafted him in the sixth round back in 2013. Carolina recently waived C.J. Anderson, so Barner will provide the team with added backfield depth behind workhorse Christian McCaffrey. Barner's impact on offense will likely be limited, but he could be a candidate for return duties. The Patriots cut Barner on Tuesday, Field Yates of ESPN reports. Analysis: Barner didn't contribute much to the Patriots in his five games with the club, logging just 42 offensive snaps and racking up 71 yards on 19 carries. With Rex Burkhead (neck) on the recovery trail, New England elected to use the roster spot to evaluate a player at a different position. Barner is now free to sign with another team. Barner is inactive for Sunday's game against the Titans. Analysis: Barner is the odd man out, with Sony Michel back from a knee injury. Meanwhile, James White is on hand to assume change-of-pace/pass-catching duties, while versatile wideout Cordarrelle Patterson is on hand in the event that Michel suffers any in-game setbacks Sunday. Barner was on the field for three of a possible 71 snaps on offense in Sunday night's 31-17 win over the Packers. Analysis: Despite the fact that Sony Michel remained out Sunday with a knee injury, Barner saw just one carry for four yards in the game. Meanwhile, James White logged 12 carries for 31 yards and versatile wideout Cordarrelle Patterson ran 11 times for 61 yards and a TD. Barner is strictly a depth option at this time and off the fantasy radar. Barner was on the field for seven of a possible 76 snaps on offense in Monday night's 25-6 win over the Bills, en route to carrying twice for four yards. Analysis: Though top back Sony Michel (knee) was inactive Monday, Barner's role was limited, as wideout Cordarrelle Patterson led the team with 10 carries (for 38 yards) in the contest and James White handled his normal pass-catching duties out of the New England backfield. Michel was listed as a limited practice participant Saturday, which suggests that he has a chance to play in Week 9. In any case, Barner is not a high-percentage fantasy option. Barner rushed 10 times for 36 yards and didn't draw a target in the passing game during Sunday's 38-31 win over the Bears. Analysis: The Patriots love their running back committees, and Barner was the next man up to join James White after Sony Michel left the game with a knee injury. White dominated the touches battle with 11 carries and eight catches (including two touchdowns), but Barner would be in line to receive some early-down work if Michel's unable to return by the time New England clashes with the Bills on Monday Night Football in Week 8. Barner was on the field for five of a possible 78 snaps on offense in Sunday's 43-40 win over the Chiefs. Analysis: In the process, Barner carried three times for 16 yards while working behind Sony Michel and James White. For now, Barner is off the fantasy radar, but if White ever misses any time, Barner could potentially carve out some short-term utility in PPR formats. Barner re-signed with the Patriots on Monday, Doug Kyed of NESN.com reports. Analysis: Barner has now signed with the Patriots three times in the past month, with each of his last two stints lasting less than two weeks. This may end the discussion about New England re-signing Mike Gillislee, who might have posed a threat to Sony Michel's workload near the goal line. Barner shouldn't have much impact on either Michel or James White. The Patriots have released Barner, Mike Reiss of ESPN.com reports. Analysis: The move frees up a roster spot for on the Patriots' 53-man roster for returning wideout Julian Edelman. With Barner not available, the team's only active running backs Thursday against the Colts will be Sony Michel and James White. Barner logged three carries for 11 yards in Sunday's 38-7 win over the Dolphins. Analysis: While serving as the Patriots' No. 3 running back Sunday, Barner was on the field for 10 of the team's 81 snaps on offense. He's clearly behind top back Sony Michel and pass-catching ace James White in the team's backfield pecking order, a reality that limits Barner's fantasy utility. 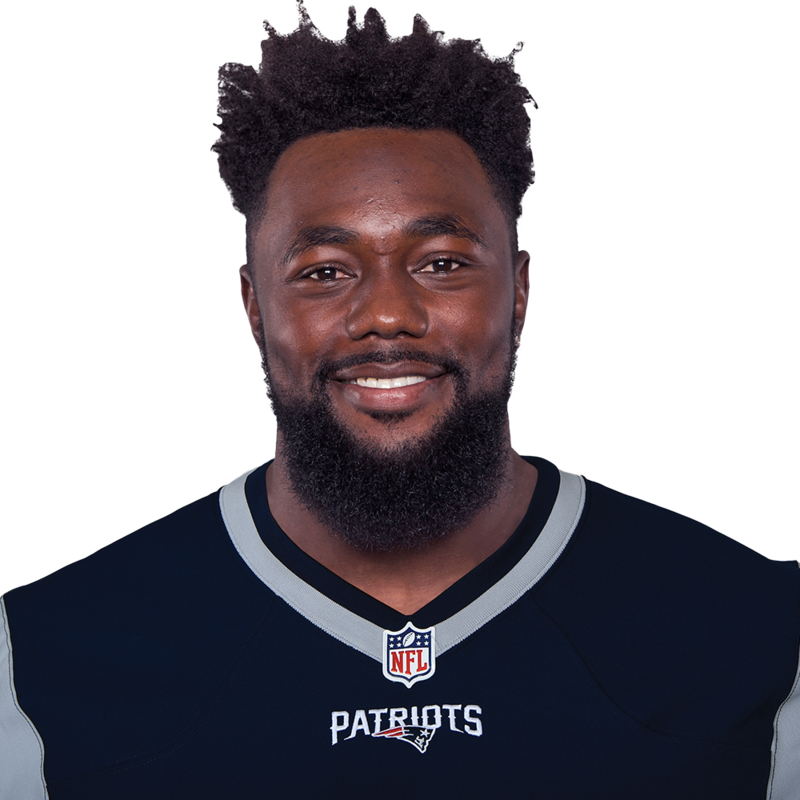 Barner officially re-signed with the Patriots on Wednesday. Barner agreed to re-sign with the Patriots on Tuesday, Mike Reiss of ESPN.com reports. Analysis: Barner was released by New England last week, but with Rex Burkhead nursing a neck injury he was scooped back up to boost depth at running back. He remains unlikely to make any noise out of the backfield, but he could revive his role as punt returner. Barner was cut by the Patriots on Wednesday, Jeff Howe of The Athletic reports. Analysis: Barner was released to make room for Cyrus Jones, who will likely replace him as a punt returner, on New England's 53-man roster. Given his return abilities and usefulness as a depth running back, Barner should eventually latch on with a team elsewhere in the league. The Patriots signed Barner on Tuesday, Mike Reiss of ESPN.com reports. Analysis: Barner will likely play a depth role at running back, but is more likely to make an impact as a punt returner. While Patrick Chung is the current Patriot in that role, Barner could potentially get some looks. Barner was cut by the Panthers on Friday, Joe Person of The Athletic Carolina reports. Analysis: Barner pieced together a decent showing during the preseason, but Cameron Artis-Payne, who outplayed him in the finale, appears to have secured the No. 3 spot on the Panthers' depth chart. Barner could be a strong candidate to latch on as a depth option with another club given his returning abilities in addition to being a capable depth back. Barner rushed six times for 16 yards during Thursday's preseason finale against the Steelers. 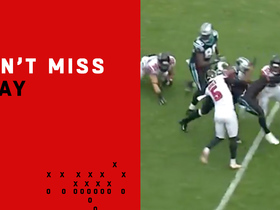 He also secured four of five targets for 27 yards. Barner is visiting the Bills on Tuesday, Ian Rapoport of NFL Network reports. Analysis: Barner spent the past three seasons in Philadelphia, where he had 71 carries and 19 catches in 36 regular-season games. The majority of his 2017 touches came in the return game, which likely would be his ticket to earning a roster spot in Buffalo, though the might also get a shot to compete with Travaris Cadet for a small pass-catching role. Barner rushed twice for 21 yards in Sunday's 34-29 win over the Giants. Analysis: Both totes came back-to-back at the end of the first quarter with the first going for 18 yards. 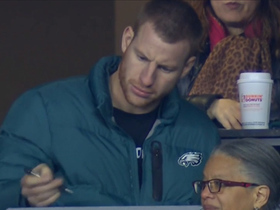 He technically touched the ball on a third successive play when he recovered Nick Foles' fumble on the last play of the period. The Oregon product reverted to his primary role as a returner thereafter. 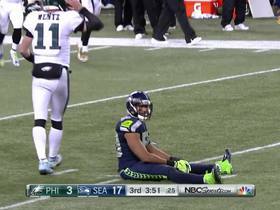 He remains a distant fourth on the Eagles RB depth chart. Barner (hamstring) practiced fully Wednesday. 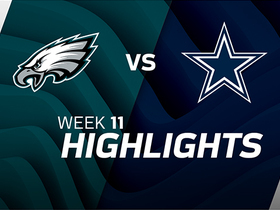 Analysis: Barner has been available for each of the Eagles' past five outings, but his special-teams snaps (49) have outpaced those on offense by two. As a result, he's totaled 12 carries for 34 yards and three catches (on four targets) for 20 yards on the season. Following the addition of Jay Ajayi via trade Tuesday, Barner is now in danger of being a regular on the inactive list, if he's not cut outright. Seattle Seahawks linebacker K.J. 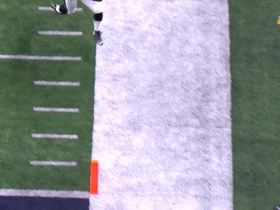 Wright's fourth-down blitz pays off, and the Seahawks get big stop. 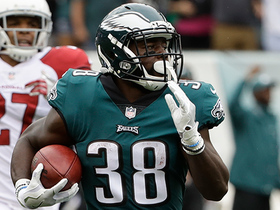 Philadelphia Eagles running back Kenjon Barner fights his way into the end zone for a 4-yard touchdown. 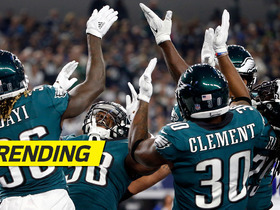 Philadelphia Eagles running back Kenjon Barner leaps into the air and is able to keep both feet in bounds along the sideline for a 22-yard grab. The "Good Morning Football" crew reveals the NFL Players of the Week for Week 5. 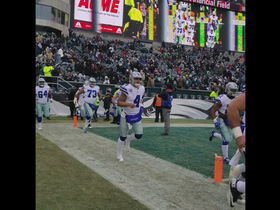 Philadelphia Eagles running back Kenjon Barner returns a punt 76 yards. Cincinnati Bengals kicker Mike Nugent makes a huge tackle on a kickoff return by Philadelphia Eagles running back Kenjon Barner.